Fully featured Office 12 like Ribbon Control with KeyTips support, fade animation effects etc. Fully featured Office 12 like Super Tooltips control with 18 color schemes. 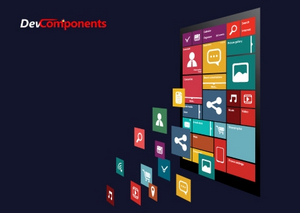 With built-in scrolling support, popup abilities and automatic resizing. We include two types of Office 2007 style forms: Ribbon Style and Standard. 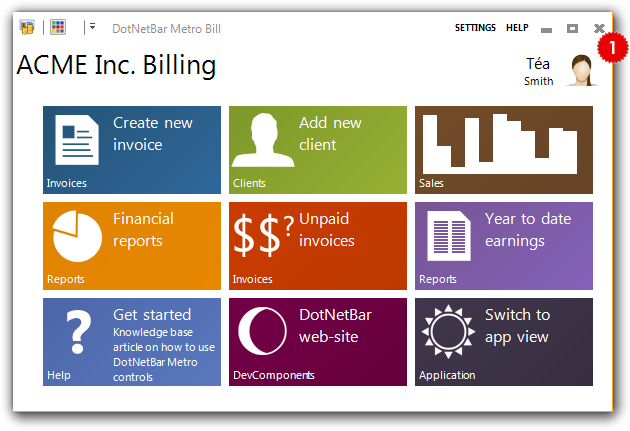 DotNetBar provides multiple styles for menus and toolbars that can be changed on the fly. Create Navigation Pane user interface with ease. DotNetBar also provides the dockable windows for your applications. Dock windows inside of the client area of the form any way you want. Use this powerful feature to provide your users with ultimate flexibility and usability when using Dockable Windows. Your end-users can tear-off tabs from dockable windows or they can dock other dockable windows as a tabs. Position Tabs on Dockable Windows on any side of the Bar. DotNetBar Dockable Windows and Bars provide you with true What You See Is What You Get docking functionality. Do not guess where your window will be docked based on hard to see outline, DotNetBar shows in real-time position of your window. DotNetBar toolbars are dockable and you have full control where they can be docked or whether they can be undocked. DotNetBar fully support Windows XP Themes. This means that your user interface will always have the latest visual styles provided by Windows XP. Create popup menus or toolbars simply by setting the PopupType property on your items. Since release 2.0 of DotNetBar suite Windows XP Explorer-bar control with full Windows XP Theme support and new Style interface is available. Includes 18 predefined color schemes. Included with DotNetBar is Outlook style side-bar control with same easy-to-use interface and complete Windows XP Theme support. Convey important bits of information to your users easily with Balloon control. You can popup any control from toolbar or menu item. See Notepad sample color selector for great example of this feature. ControlContainerItem will let you host any Windows Forms Control on menu or toolbar. DotNetBar provides the extender property to all your controls that allows you to set the context menus with one mouse-click. Use TaskList layout type to create Office XP like task panes. With release of Windows XP the user interface guidelines have been changed and up to three different image sizes are recommended for toolbars. DotNetBar Color Scheme model lets you change and customize the color of almost every visible part of DotNetBar menus and toolbars. You can store item images directly in DotNetBar which eliminate the need to use ImageList control and simplifies the management of your menus and toolbars since everything is in one place. Create menus that can slide, open, unfold or fade. DotNetBar provides great flexibility on how these effects are used: use system default settings, set control wide effects or set them for each item. Reduces the menu complexity by hiding unused menu items. Save and restore complete DotNetBar configuration and usage data in XML based format at run-time or design time. DotNetBar automatically creates disabled or grayed images from the basic image you provide. DotNetBar lets your end-users customize both menus and toolbars at run-time. You are in full control so you can disable this feature or disabled it only for particular items. You can create your own items and that way extended DotNetBar functionality. Included with DotNetBar is multi-functional panel control with color scheme support, gradient background colors, background images and mouse state support. TabStrip control on steroids includes automatic MDI child form management feature. Container tab control with multi-line tab support and much more. Distinguish your applications with this unique toolbar control. Manage sparse screen real estate with powerful simple to use expandable splitter control.